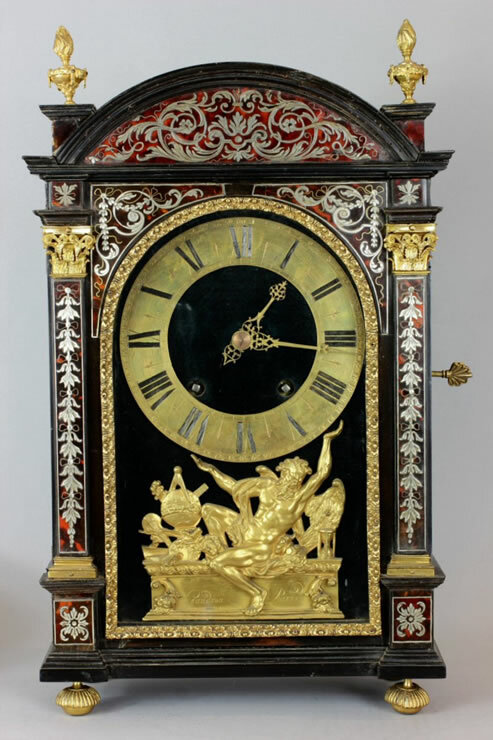 Louis XIV red tortoiseshell pendule religieuse with Boulle pewter marquetry and movement signed Gaudron AParis attributed to the Boulle workshop. The arched top, with flanking ormoulu vases has a Boulle panel composed of scrolls above the arched glazed opening for the clock dial that is supported by a seated profile figure of Father Time. The clock dial is flanked by capital-headed pilasters decorated with a ribbon tied acanthus bands. The sides are decorated with red tortoiseshell panels framing glass in arched openings.